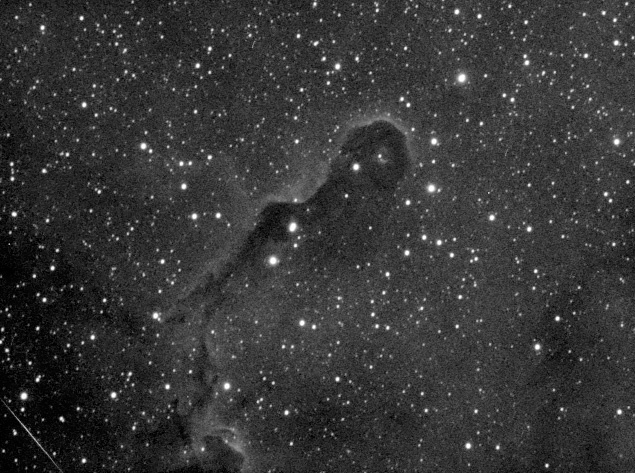 Comments: Another quick test shot of the Elephant Trunk Nebula in Cepheus taken with a nearby full moon to see if guiding was working OK. Unfortunately, I still have guiding issues and so now only option left is to try a different scope in place of the MN56. I suspect that mirror shift maybe the problem. Image is very noisy due to moon and lack of exposures and I will certainly revisit this once I sort out my guiding. The white streak at the bottom left of image is actually a Perseid Meteor from the shower that peaked two days earlier.